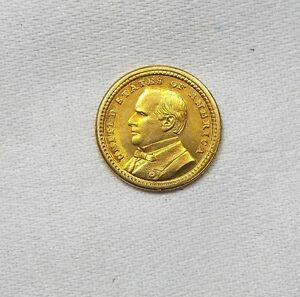 Judging solely by the number of times his portrait has appeared on coins and currency, William McKinley is one of the most highly honored of our United States presidents. In this respect, he joins such distinguished figures as Washington, Jefferson and Lincoln. Although McKinley was a man of some accomplishment, his greatest recognition came as the victim of a crazed assassin. This elevated him to a status that he had never enjoyed previously and brought him honors usually reserved for those whose achievements occur during their lifetime. 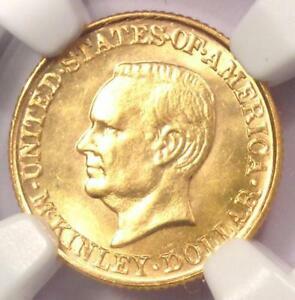 Among the posthumous tributes to this slain president were the McKinley Memorial gold dollars of 1916 and 1917. William McKinley was born in Niles, Ohio on January 29, 1842. His budding career as a school teacher was interrupted by service in the federal army during the Civil War. Attaining the rank of major by the war's end, he took up the study of law and became a practicing attorney in Canton, Ohio. Entering Republican politics, he served fifteen years as a Congressman beginning in 1876. During this time, he became a strong advocate of the "free coinage" of silver, a position that would cause him some embarrassment in his later campaign for the presidency. Finally defeated by his unpopular call for protective tariffs, Representative McKinley nevertheless drew the attention of Republican Party Boss Mark Hanna, who successfully ran the war veteran for governor of Ohio in 1891 and again in 1893. As the presidential election of 1896 approached, Hanna and his cronies backed McKinley for the Republican nomination on a ticket which hailed the gold standard, sound money and protective tariffs. At the party's convention, some western proponents of free silver cheered McKinley, still unaware of his shift in politics. Such compromising of his own views while under the thumb of party leaders would come to characterize McKinley's presidency, which he won by a narrow victory over William Jennings Bryan, deliverer of the famous "Cross of Gold" speech. The pre-eminent event of his 4-1/2 years in office was the Spanish-American War of 1898, a one-sided affair which McKinley attempted to resolve through diplomacy. His influential mentors, however, were spoiling for war, and they forced him to come over to their side. Re-elected in 1900, McKinley was only six months into his second term when he was assassinated in the city of Buffalo while attending the Pan-American Exposition in September of 1901. He died a week later on the 14th. Over the next year or so, a plethora of memorial souvenirs and literature eulogized the slain president, many of a tasteless and highly commercial nature. 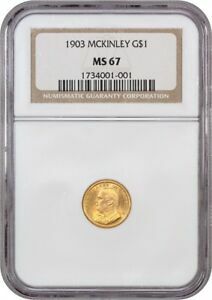 Nearly fifteen years passed, however, before an organization calling itself the National McKinley Birthplace Memorial Association beseeched Congress for a commemorative silver dollar in his honor. Proceeds from the sale of these coins would be reserved for the building of a memorial structure in the town of Niles. It was not stated in the proposed legislation, but a number of writers have pointed out that 1917 marked the 75th anniversary of McKinley's birth, and this may explain the timing of the memorial campaign. Not so easily explained is the curious selection of a silver dollar for the commemorative. 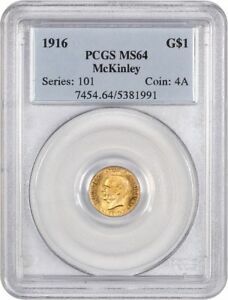 In hearings before a House committee during January 1916, Colonel Joseph Butler of the Memorial Association objected to the proposed coin, since McKinley's opposition to the silver dollar and his promotion of the gold standard had been key issues in his presidency. 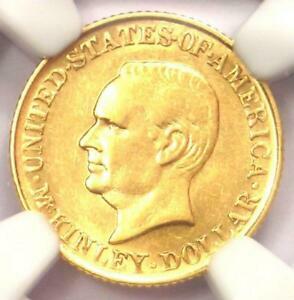 A gold dollar was a more appropriate recognition, Butler argued, and the bill was amended to authorize the coining of not more than 100,000 of these coins. It passed on February 23. 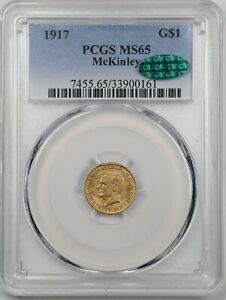 After suffering protracted arguments with the Commission of Fine Arts over the recent Panama-Pacific coinage, the U. S. Mint evidently wanted to streamline the design process for the McKinley coin, as it assigned the preparation of models to its own staff. Chief Engraver Charles E. Barber, then in his final year of life, sculpted the obverse, a mediocre profile bust of the late president that scarcely resembled him. 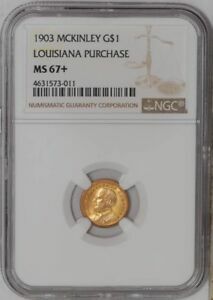 Several numismatic authors have commented that Barber seemed to be avoiding any comparison with his earlier portrait of McKinley that appeared on one of the Louisiana Purchase Exposition dollars in 1903. Barber's advanced age (76) is a more plausible explanation. His Assistant Engraver, George T. Morgan, created the reverse, a facing view of the McKinley Birthplace Memorial structure. This model was even worse than Barber's; architecturally inaccurate and crudely rendered. 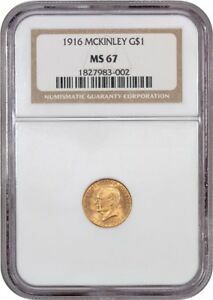 When combined with the fact that these coins, aside from a handful of proofs, are often seen weakly struck, the whole makes for an aesthetically poor creation. Objections tendered by the Commission of Fine Arts were simply ignored. The worst was still to come, however, when the Association attempted to market these mediocre coins to the public at $3 apiece. Some 20,000 gold dollars dated 1916 were coined in two batches, the first in August and the second in October. There are no distinctions between these two strikings. A third press run of 10,000 pieces occurred the following February, all dated 1917. It's not known whether the second date was an intentional attempt to create repeat sales or merely coincidental. 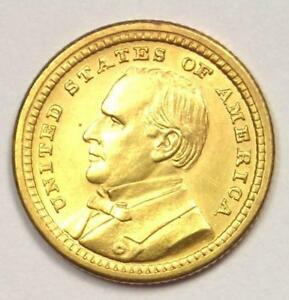 Whatever the case, sales of the McKinley Birthplace Memorial dollar were a flop. Unaware of previous failed attempts by commemorative coin sponsors to sell gold dollars at such a high price, the Association was stunned by its failure. In desperation, it sold as many as 10,000 coins to famed Texas numismatic promoter B. Max Mehl, as well as other, less flamboyant dealers. Some uncertainty exists respecting the number of each issue that was sold and the number melted. 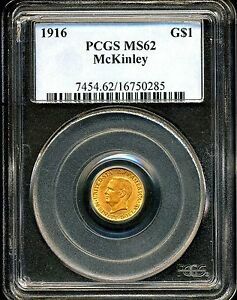 Walter Breen gave a figure of 20,026 1916 dollars coined (the odd 26 pieces were reserved for assay and later destroyed) and 10,023 melted, leaving a net mintage of 9,977. For 1917, he wrote that all 10,000 coins were distributed, with none melted. 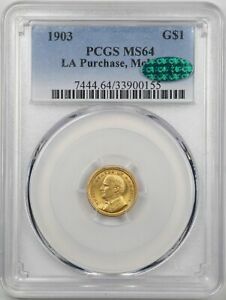 Q. David Bowers countered with information furnished by B. Max Mehl, who claimed that around 15,000 of the 1916 dollars were issued, while only about 5,000 of the 1917 coins escaped the melting pot. Bowers pointed out that Mehl was present when all of this was happening and was thus in a position to know, and he likewise revealed that the frequency of appearance is distinctly greater for the 1916 dollars. 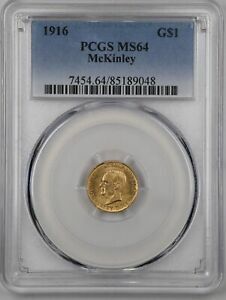 The typical McKinley dollar is poorly struck around its peripheries. A number will show frosty luster, although the majority have somewhat prooflike surfaces. 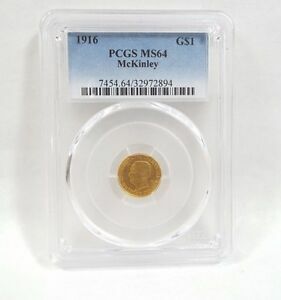 On the 1916 coins, which were sold at least in part to the general public, friction may appear on the obverse due to mishandling. The reverse is usually is better shape. 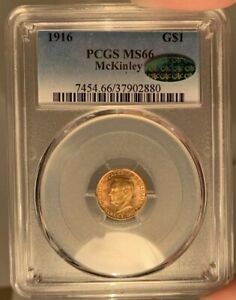 This is true overall for the 1917 issue, nearly all of which went to dealers and speculators and were ultimately sold to coin collectors who took better care of them. 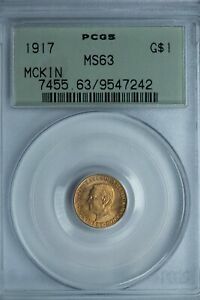 1916 coins are usually available in grades of AU-55 through MS-64; higher grade coins are scarce. 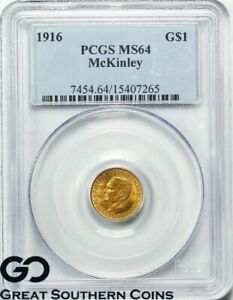 The 1917 dollars are less frequently encountered, but choice and gem specimens survive in higher proportion; circulated examples are seldom seen. 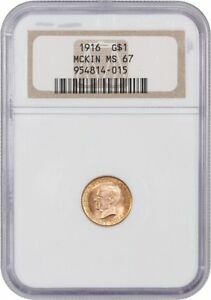 Points to examine for the first signs of wear include McKinley's temple and the hair above his ear; on the reverse, check the pillar above the second numeral 1 and the base of the flagpole. 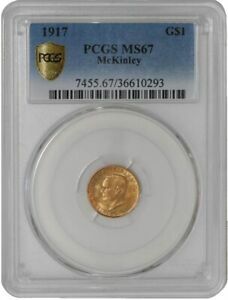 Counterfeits exist for this issue; the crudity of genuine coins makes the identification of fakes a challenge, and authentication is recommended for any coin of this type. At least six brilliant proofs dated 1916 are known, while another five exist for 1917. These exhibit extremely sharp details and complete rims, both often lacking on regular strikes. Some minor varieties may be found, as the date was punched by hand into each working die. Two types of original packaging are also collectable. The first is a small paper envelope printed "The National McKinley Birthplace Memorial Association, Youngstown, Ohio," with a space provided to indicate the number of coins inside. Also found is a Christmas card that holds a single McKinley dollar.